monna enwa o bolailwe ke boloyi. monna ke nko e metsi. magwole a pudufetse ke ho kgumama. Hase kwatsi ya nqulase, ke boloyi. o ingamangama ke letswalo la feela. Lefu la setjhaba ke ho hloka tsebo. masolenyane le oona a ile. that your mother is a witch. a man is a wetnosed god. her knees a worn out from kneeling. not lack of *Timjane and Umbhejane. blood soldiers are also gone. each human being is an image of God. she can only bewitch you with a bible verse. it holds away the falling skies. it’ s the story of our childhood. film stars and mothers of the nation. it is a song of hope, it is a song about tomorrow. it wakes the little girl inside me. *Mankokosane, pula e ea nare tla hola neng? There is no English translation for `Mankokosane, but some informal sources say it is the name of a rain god. The song also describes the kind of dance Basotho children would do at the beginning of light showers of rain. They skip, hop and sing that: ‘the rain is falling and ask when they will grow up’. **Ha tsatsi le chaba – when the sun comes up. This suggests that the children see themselves as little crops that are being watered by the rains and will have become taller when rain the stops falling. 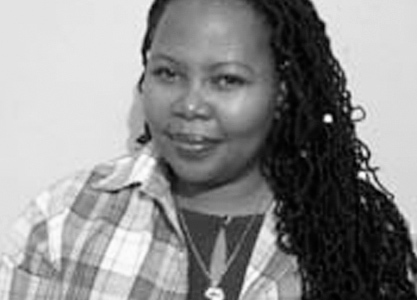 Hale Tsehlana is the Faculty Advisor for the Stellenbosch University Poetry Society, which she assisted to establish. She is a published poet and has read and performed her poetry in and around South Africa, India, Germany, UK and South Korea. Her collection titled Poems and Songs from the Mirea was relaunched in August 2007 at a special celebration for the International Federation of Library Associations and Institutions hosted by the South Africa National Library for the Blind in Grahamstown and it has been published in Braille and Audio. In the face of current debates on multiculturalism and multilingualism in South Africa, this book takes a multimedia and multilingual approach to poetry with English, Afrikaans and Sesotho poems. The book encourages local writers to reach out to marginalized communities who may not be able to read and write; hence it is made into Braille. She recently translated a children’s book Phapo’s Gift that will be suitable for use in primary schools. She is featured in Ink@ boilingpoint, a collection of poems and essays by women from the Southern tip of Africa, (2004) 2nd edition. Voices from the Free State (2004), an anthology of Prose, Verse & Creative Articles by Indigenous Women and Youth of the Free State Province, and Basadzi Voices, an anthology of poetic writing by young black South African Women, published in 2006 by University of KwaZulu-Natal Press. Hale Tsehlana was selected to attend the November 2007 Asia Africa Literature Festival in Jeonju South Korea and in May 2008 she represented South Africa as one of the 20 young writers selected world wide to participate in the Seoul Young Writers Festival. In 2009, she presented the Words on Water Festival – Stellenbosch Satellite event sponsored & co-hosted by the by the Indian Consulate Cape Town Office & Stellenbosch International office.